This page in under construction...The 2002 Subaru WRX, is currently available as a sedan and Sport Wagon, is powered by a 2.0-liter, 227-horsepower turbocharged intercooled engine. 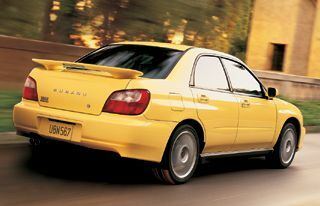 Inspired by the Subaru Impreza World Rally Championship car, the All-Wheel Drive 2002 Impreza WRX models offer performance in league with such respected all-wheel drive European sport sedans such as the Audi A4 Quattro and the BMW 325 performance models which are more expensive. In comparison with some American cars such as the Ford Mustang GT, Ford Mustang Cobra, Chevy Camaro Z28, Pontiac Firebird Transam, the WRX offers similar straight line accelleration for a similar price. However, the All-Wheel Drive traction and superior construction provides it with it better handling. The WRX is a true phenomenon. When a WRX is on the street, heads turn and people stare because people generally know what sort of car it is. For some reason, little kids seem to really love the WRX. They jump up and down when they see one!! ENGINE: Horizontally Opposed 2 Litre, 4 Cylinder Turbo engine. POWER (AUS): 160kW at 5600RPM AND 292Nm of torque at 3600rpm. POWER (USA): 227HP at 6000RPM AND 217LB-FT of torque at 4000rpm. SPEED: 0-100km/h (0-60mph) in about 6.0 seconds. FEATURES: Dual Airbags, Anti-lock brakes, Airconditioning. GRIP: 17-inch alloy wheels (AUS) , All-Wheel-Drive. Note : I receive many emails saying that the 0-100km/h or 0-60mph times posted on this site are incorrect. These times can vary depending on air temperature, air pressure, altitude, number of passengers and type of fuel used. The fuel used in Australia, generally has a lower octane rating than fuel in most other countries. While the fuel in Japan generally has a higher octane rating than most fuels used in the USA.